Tonight, I cut up the Kansas Troubles Snow Blossoms fat quarters to quickly put together the quilt for my mom. I fell completely in love with these fabrics as I fiddled with the pieces – I truly didn’t expect that at all. There were a few Bound to the Prairie FQ’s in there, too, and I adore them, too. 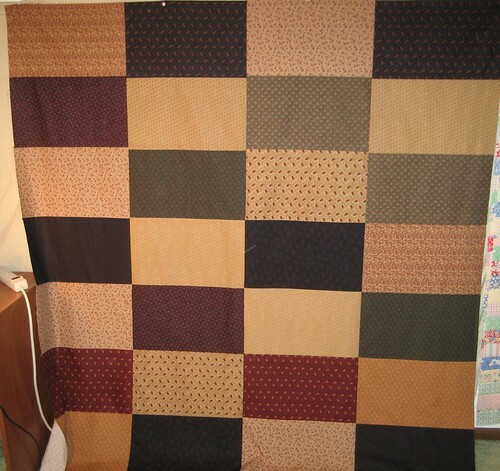 I do not want to give this quilt to my mother. I cut a couple of blocks too narrowly, which resulted in corner shenanigans not fitting up perfectly here and there, but on the whole? I love this thing. I’m not one to be drawn to traditional, conservative, country fabrics, but… the colors are so rich, the patterns charming and the quality of the fabric itself is lovely. I may end up making one of these babies for myself. Even more endearingly, the top took less than two hours to piece together – now that’s a project I can really get behind. The cutting may actually have taken more time. Nice. It’s easy, it’s simple, it’s attractive… yay. After I had everything all nicely cut out, I realized I had too many dark rectangles, and needed more fabric. I had some perfect stuff on hand, but it’s been pre-washed. Blargh! Well, I reckon we’ll see how mismatched/shrinky things become with the washed and unwashed stuff, along with the flannel on the back. Hm. Maybe, just maybe, it will be too awful to give as a gift? Maybe? I’m thinking of hand-tying this one, for reasons that currently escape me. I haven’t even looked into how one does that, but it sounds less bulky than trying to wrangle an almost-full-size quilt through my little sewing machine’s throat. I’d almost rather chew off my own legs.